If you use Fongo as your cell phone service, which is based on VoIP. You will have to be aware of keeping your Fongo app running in different situations, including that your phone goes to sleep such as closing phone cover and screen is off. Otherwise you might lost incoming calls and text messages. China No1 Telecommunication Product provider Huawei Inc. just released 4 brand new smart phones in MWC 2012 (Mobile World Congress 2012) today. There is a Pegasus sculpture outside the MWC venue in Barcelona. 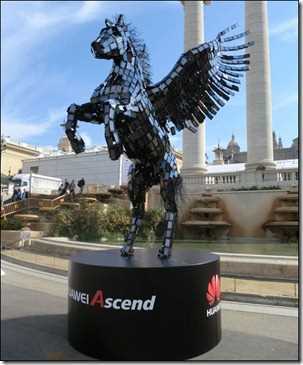 Huawei think the Pegasus is a symbol of their rapid cellphone’s growth obviously.